May | 2011 | Beer Apprentice - Craft Beer News, Reviews, Interviews and Info. Time for another beer review!!! Tonight, I thought I would sample another brew from the Sierra Nevada Brewing Company located in Chico, California. But which one? There are so many to choose from. It’s been about 90 degrees at my house this afternoon with the sun blazing down and humidity so thick you could cut it with a knife. Not to mention that I had to mow my lawn today, so I figured I needed a refreshing, thirst quenching brew to cool me off. I decided on the Sierra Nevada Kellerweis Hefeweizen to see if it would do the trick. The website, sierranevada.com, reassures me that it might. The Kellerweis is a 4.8% ABV beer that comes in a 12 oz. bottle. After a near perfect pour the brew appeared a cloudy, yellowish/orange color with a very nice, snow white, thick head that was somewhat soapy looking. Both large and small bubbles comprised the cap, which had great size, retention and lacing. In the aroma, I found some spicy cloves, wheat and yeast along with a mild lemon citrus note. Other reviews that I’ve read speak of a boisterous banana fragrance in the nose. It was there, but I, personally, thought it was a bit mild and almost subdued. The spice and wheat seemed to be more of a forerunner in the fragrance than the banana. In the background, I started to detect some type of artificial “plastic” smell that was somewhat odd and out of place. It wasn’t so much distracting, but rather it just didn’t seem to follow what I typically find in Hefeweizens. Oh well, let’s take a sip. From the first gulp, I got the wheat and yeast tones juxtaposed with the spicy clove and a slight peppery savor. A slight bit of sourness was noted from the lemon citrus, but it didn’t disagree with the overall flavor profile. Again, I found the banana to be mild and not very direct. Nonetheless, the taste seemed to be well balanced with no one flavor dominating the other. The mouthfeel was medium to light, very crisp, refreshing and smooth. It was a tad on the watery side, which justifies the thirst quenching abilities of this brew. Not a whole lot of flavor was left on the palate either, however with a thirst quencher like this, one may not want much. Well, it would be so easy to “slam” several of these on a hot day like today, but I actually found this to be a relatively standard “Hefe.” It’s very nice looking, sessionable and decently well balanced. I would have no problem drinking it again if it was offered, although I was expecting it to be a bit better. I love the brews Sierra Nevada brings to the table, but I’m starting to come to the sad conclusion that maybe I just don’t like this style of beer in general….. regardless of who makes it. With that being said, if you favor a Hefeweizen on a hot, humid day, give it a try and let me know what you think of it. Is Sierra Nevada a favorite brewer of yours? What beer do you most like from them? Thanks for reading guys. I really appreciate it. I hope you are enjoying the reviews because I have many more to come. Today, I thought I would review another IPA. It’s been a few posts since my last one and I was in the mood for a fresh, hoppy ale. 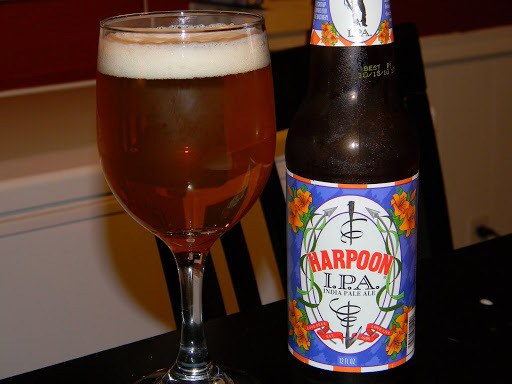 The beer of choice is the Harpoon IPA from the Harpoon Brewery located in Boston, Massachusetts. This is the flagship brew from Harpoon and one that I have, actually, never had. Harpoon IPA is an interpretation of the classic English style using hops and malt grown in the United States. The high hopping of Harpoon IPA is not only noticeable in the nose but especially in the finish. The lingering bitter finish of this beer is not harsh or astringent, but crisp and pronounced. This is created, in part, by dry hopping – a technique that involves adding fresh hops to the conditioning beer to provide a fresh hop aroma. This beer is floral, medium body with an aggressive, clean hop finish. This brew sounds enjoyable, so let’s give it a try. The Harpoon IPA has an ABV of 5.9% and comes standard in a 12 oz. bottle. After the pour, this brew appeared clear in the glass with a color range of orange to light amber. A mostly white, slightly creamy head was produced from an easy pour that had ok size, but did not have an extremely long retention time. The lacing was decent as it adhered to the sides of the glass pretty well. The smell was nice with the expected hints of grapefruit citrus along with qualified notes of orange and even some lemon. Nice and fruity. A few floral notes came on strong as the brew settled followed by some perfume”y” redolence. As it warmed, an earthy malt became evident, which, to me, seemed to calm the overall hop profile of the aroma. Not bad. It seemed to be balanced very well, however it’s not overly boisterous or vigorous. The taste brought forth a nice, little hop “bite.” More of the grapefruit citrus and fruit was found along with further hoppy bitterness from a resiny and piny distinction. Again, as the brew developed, a malty backbone gave it some stability to round out the resume. Nice and easy in the flavor department. Not flourishing or extremely potent. The mouthfeel was medium, smooth, crisp, dry, somewhat refreshing and punchy. The palate is saturated well enough to leave a significant amount of flavor behind. Overall, the Harpoon IPA is pretty good. It’s not quite as complex or daunting as some others I’ve had, but I still found it to be enjoyable and easy to drink with plenty of proper IPA “goodness.” I would be more than happy to drink it again if it was available. It’s worth a try if you see it, but don’t expect an over-the-top hop “bomb.” Instead, expect a beer that is solid, even and proper with enough character for a good representation of style. This could be a decent introductory IPA in my opinion. Pick it up, try it and let me know what you think of it. Please leave a comment if you so desire. Thanks for reading guys. Hope everything is going well in your “craft beer” world. It’s time for another beer review!!! Are you guys ready?!?! I am!!! 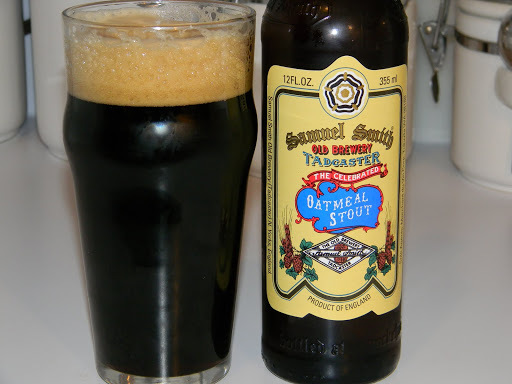 Tonight, I want to profile another brew from the Samuel Smith’s Old Brewery located in Tadcaster, North Yorkshire, United Kingdom called the Samuel Smith’s Oatmeal Stout. Samuel Smith makes several different styles and all are known for being solid and good, so this one should be no different. Here’s a snippet from the website, samuelsmithbrewery.co.uk, about the Oatmeal Stout. This beer comes in a 12 oz. bottle and has an ABV of 5.0%. The appearance was an opaque, dark brown, almost black color with a luscious, tan, thick, flamboyant head. Wonderfully sized with a prolific amount of lacing left behind. A new ring was formed after each sip. Dark, ruby/red highlights were visible only when held directly toward a light source. It looked very nice. The aroma beget notes of roasted coffee yielding to fragrances of cream and dry oats. A delicate sweetness is detected, most likely from the oats, as well as from an induced milk chocolate tone that blends in perfectly after a few moments. Very nice!!! Once I took my first sip, some dry, roasted oats began the show as well as a mild, complementary nuttiness. A coffee flavor is inconspicuous at first, but really starts to shine and become more dominant as the beer crosses the palate toward the back of the throat. A silky, smooth milk chocolate feature was more distinguished and forthcoming in the taste also. Only the slightest bit bitter, which let me put full concentration on the rich, robust, malty aspects of the profile. Extremely well balanced, even and really good. The mouthfeel was medium to medium/full, dry, smooth, creamy, precise and appropriate. As I swallowed, an almost slippery, oily texture was felt, of which I found very delectable. A soothing warmth was felt too even though the ABV is relatively low. The palate is doused with enough flavor to allow me to wait several minutes before I lifted the glass for another gulp. An outstanding mouthfeel with this one for sure. Wow!!! That’s about all I have to say. Truly an extraordinary Stout. More than satisfactory in all aspects. The aroma and taste were balanced superbly. No one character dominates or outshines the other. I have had several different Sam Smith’s brews and this one could very well be my favorite. This Oatmeal Stout was very easy to drink, thus making it a beer that I could drink for hours on end and be completely enamored by. It could be drunk at any time during the year. It had enough complexity and character that even the most experienced “craft beer” drinker could find enjoyment with it in my opinion. This is a beer that I will be sure to pick up from time to time just so I can drink a well rounded, great, solid beer without any of the pretentiousness that some “Imperials” seem to convey. No question about it, if you have not had the opportunity to try the Samuel Smith’s Oatmeal Stout, don’t hesitate to give it a go. It’s worth it. What Samuel Smith’s brew is your favorite? Thanks, again, for reading guys. Have a great Memorial Day weekend and be safe out there.